"There was activity in every room, it seemed. Maura showed us various classrooms, each staffed by at least one teacher and several current students. We learned more about education at Mercy College with each room visited: science laboratories, visual art workshops, a cooking class followed by a room filled with sewing projects, an impressive library, where works by Irish authors are, of course, a primary focus. We visited a computer room and the gymnasium; we witnessed some authentic Irish Dancing. We met teachers in charge of special education as well as adult education, the latter of which has become increasingly prevalent in Ireland. There was a room that had been dedicated to the victims of Omagh; the aura was sad, but prayers for healing and peace were prominent". Fifty students with parents and teachers from St. Mary's college, Ponsonby, Auckland, New Zealand visited Ireland directly after Easter. 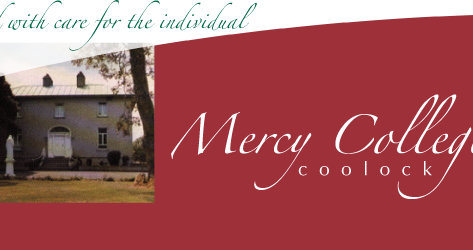 They are a Mercy School founded 150 years ago by Irish sisters of Mercy from Carlow. 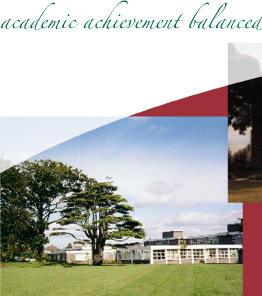 The boarders live in a residence called "Coolock House". While in Dublin, the girls stayed with families from Mercy college, Coolock and Our Lady of Mercy, Beaumont. The visitors presented an enthralling musical concert in both schools. This meeting of Mercy students from across the globe was a delight for all concerned. The C.H.A. forum has met on Tuesday mornings in the Parents room, Mercy College since Christmas. The forum consists of representatives of statutory, voluntary and community groups and parents who work in the area including: Dublin Corporation and Northside Partnership, the school attendance service, Home-School-Community Liaison Co-ordinators representing Mercy College, St. Brendan’s B.N.S. and Scoil Chaitriona infant and senior schools, St. Paul’s Youth Club, Our Lady of Mercy Parish, Justice Group and Community Parents. To ensure that everybody in the community can reach their full potential. To liaise with the various agencies to improve the environment in which we live. To compile a data-base of all statutory, community and voluntary providers to the area and within the area. To develop a programme to address the social, spiritual and recreational issues affecting our area. An exhibition of student and parent art in Mercy College took place on 22nnd and 23rd April. Many people visited the exhibition. The work was of a very high standard and it was greatly enjoyed by all.! The Transfer Programme, which is run annually by Home-School-Community Liaison to help prepare prospective students for life in Mercy College, has started, with parents facilitating the new students in workshops where they discuss their hopes and concerns about starting at second level. Four separate sessions have to be held in order to accommodate the number of new students. I would like to take this opportunity to thank the parents who so generously give their time to help new students make an easy transfer from Primary to Post-Primary School i.e. Mrs. Maureen Smyth, Mrs. Carol Lo, Mrs. Stephanie Kavanagh, Mrs. Mary Moore, Mrs. Vera Brennan and Mrs. Catherine Costelloe. A word of thanks also to the 5th and 2nd year students who acted as "big sisters" to the new students, bringing them on a tour of the school and helping then in the workshops. The second annual Debating League is currently underway. The semi-finals will take place before Easter and the Grand Finale will be held in the last term. The debates in the early rounds were of a high standard with many newcomers putting up a stern challenge to our veteran debaters. Lister carefully to "Near Fri" during the last week in April as a term from Mercy will be involved in a live debate. This is the second year we have been invited to speak at this event and it promises to make for lively listening. 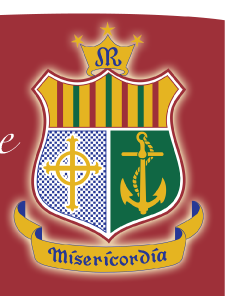 The Mercy College Debating Sociaty meets every Monday at 12.30 p.m. in Room 30. All are welcome to come along – to debate or to listen! The three teams playing in league have had mixed fortune this season. The Seniors won two and drew one out of their five matches, in the Leinster llleague. They are still hopeful of getting into the final of the Northside league. The Minor Team played Holy Faith, Clontarf, Sutton Park and Mt. Temple in the Northside league. They were unfortunate not to beat Mt. Temple, as the play was in the opposition half for most of the match. The beginners team played Holy Faith, Clontarf, St. Joseph’s, Lucan, St. Wolstans, Celbridge and Kings Hospital in the Northside league. The school league will be starting after Easter and new members are always welcome. The first year students took part in the project "In the Swim" in Trinity Sports and Leisure Club on Thursday March 11th. The objective of the project is to give the students an afternoon filled with fun, games and laughter with an educatiional slant on healthy eating. The project was sponsored by the National Dairy Council. First there was a swim enlivened by aqua-aerobics. These were capably demonstrated by twelve of the students. The talk was given by nutritionist Caroline Martin and the finale was a raffle for prizes. Our students entered into the programme enthusiastically and enjoyed it very much. The girls were escorted by four members of staff, Ms. Boyle, Ms. Sullivan, Ms. Cullen and Ms. Heade. Congratulations to Leonie Troy 5th year who was a runner up in the Telecom Eireann Call Card Competition. On Friday 5th March two choirs represented Mercy College in the Wesley Music Festival. Both choirs performed excellently and the ‘Rhythm of Life Choir’ received a ‘highly commended’ certificate for their efforts. On Saturday 6th March Judith Gannon, a 5th year student took part in the piano solo competition and came 2nd for which she received a silver medal. On 23rd March a second year choir took part in the Feis Ceol while they did not win they sand really beautifully. Well done to all the students who performed and good luck in the future Choir and Practical Exams. Students from Mercy College were invited to sing with St. James Choir & Orchestra in St. Brigids Church, Killester on Saturday 27th March and in Star of the Sea, Sandymount on Sunday 28th. This was a great honour for the girls, who thoroughly enjoyed and benefited from the experience. inform the Health Promoting Schools Programme in Mercy College. Raise awareness among the student body of the importance of a healthy lifestyle. Gather information on community needs in relation to Health and Lifestyle. Comhghairdeas le na cailíní seo a leanas a bhuaigh scolaireachtaí sa Scrúdú Scoláireacht na Gaeltachta le deanaí. Rachaidh siad to Coláistí éagsúla chun freastal ar chúrsaí i rith and tsamhraidh seo chugainn. Go n-éirí an t-ádh leo. Congratulations to the above who recently won scholarships to the Gaeltacht this summer. We wish them well. 5th years have been actively involved in visiting Career Exhibitions and Open Days this term. One interesting aspect of their Career Programme has been these out of school activities. These started in February with a visit to "Opportunities ‘99" – Ireland’s largest career education and skills showcase. This Exhibition was organised by FAS in the R.D.S., Ballsbridge and was an overwhelming success. Then in March the R.D.S. Ballsbridge was once again host to another Educational Exhibition, this time organised by City of Dublin V.E.C. 5th Years made their way there to find out first-hand from representatives details on Post-Leaving Certificate courses on offer in the Dublin area and they were not disappointed. Finally, University College Dublin held their annual Open-Day on March 23rd and all 5th years and some 6th year pupils had a wonderful day exploring the Belfield campus and hearing about the many courses on offer there. The sun stone and some present pupils met up with some recent Mercy College past-pupils who have just started studying at U.C.D. last September. Their interest, enthusiasm, general good humour and manners as displayed on these trips have been noted by all who came in contact with them. Special thanks from Mrs. Teeling to 5th years and 6th years for their exemplary behaviour and genuine willingness to learn and expand their knowledge of possible career options and possibilities out here. he outing consisted of a guided tour of the Dáil where the troup witnessed the Oireachtas debate. This was followed by a talk in the Seanad given by Councillor Ivor Callely F.F. The students were thrilled with the informatiion and intend to produce project work on the Oireachtas as part of their Junior Cert. C.S.P.E. requirements. Immediately afterwards the students took a look at "The Books of Kells" in Trinity College. After lunch they had a very interesting tour of Dublin Castle. Both groups behaved very well and a beneficial, interesting enjoyable day was had by all on both occasions. Just before Christmas, the Minister for Education announced additional library funding to schools. At the launch of this initiative, the Minister stressed the importance of literacy. Improving reading skills is a key element of improving literacy skills. The Minister emphasised that "if high standards of reading and of literacy are to be achieved and maintained, children must have easy access to a wide range of books and reading materials.."
£5,360.00 was our share of the gift from the Minister. We look forward to filling the shelves with books relevant to every department in the school. We want to encourage all students in the school to avail of the services which the library offers. Reading is a gift for life and benefits one in many ways. Maths tuition was given to 3rd year students after school on Wednesday afternoon earlier this year/ Thirteen student tutors from Dublin City University volunteered to give a 4 week tutorial in Maths. There was an overwhelming interest in this project and our students have benefited in many ways from this unique opportunity. The Minister for Education and Science has asked the National Council for Curriculum and Assessment (NCCA) to revise the subject syllabuses for the Leaving Certificate programme in the context of the national programme of curriculum reform currently in progress. This process of revision is being implemented on a phased basis. An important element of the new Leaving Certificate English Course will be the comparative study of texts which presupposes a high standard of literacy for students entering the programme. So students should attach considerable importance to reading widely.